First of all, Honnold is a most compelling protagonist: prickly and distant yet affable, open yet reserved, modest yet competitive. Throughout the film, you can’t figure out if you actually LIKE him or not, which is perhaps the most fascinating part of all. No, wait, the most fascinating part of Free Solo is trying to figure out what makes this guy tick and how someone like this can actually be walking around with the rest of us. He’s weird, he’s gifted, he’s funny, he’s obsessed, he’s charming, he’s unpretentious—but, mostly, he’s simply the best at what he does. And what he happens to do is risk his life for a living. Yes, the details of how he attempts to climb the 3,000 foot El Capitan, known as the most challenging rock in the rock climbing world, are what make this movie run, but the underlying portrait of Honnold is what makes it worthwhile. Don’t get me wrong, the climbing sequence that takes up the last part of the film is absolutely HARROWING. See it on the biggest screen possible to really take in the enormity of this man’s achievement. 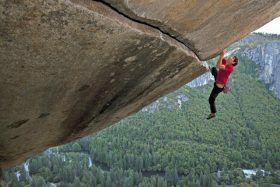 It doesn’t even matter that you know he is successful and DOESN’T die, because directors Jimmy Chin and Elizabeth Chai Vasarhelyi put you right there on the rock with Alex, literally, and the experience is exhilarating and mind-blowing. I can’t recommend Free Solo more, especially for anyone who loves nature and for anyone who has ever challenged themselves. This movie reminds you that we all should do a little more of both. Cold War is the new film from acclaimed Polish director Pawel Pawlikowski, whose previous film, Ida, won the Oscar for Best Foreign Film in 2015. It is a story of a man and a woman whose love affair spans decades, set against the backdrop of Cold War Europe. This is the kind of movie I bet most people imagine when they hear the term “art film.” It’s foreign (Polish), it’s in black-and-white, it’s beautiful and moody (read: slow) and is intense and sad. It’s everything film school was made for. Here’s the thing about Pawel Pawlikowski: his films are gorgeous. There’s a reason why this Polish filmmaker’s movies keep getting nominated for Best Cinematography: they are stunningly photographed, lit and shot. They are evocative and moody, using shadows and light to convey emotion. Cold War is nominated for THREE Oscars: Best Director, Best Foreign Film and Best Cinematography. Three nominations for an obscure black-and-white foreign film set in Poland in the 50s? That’s crazy. Yes, you could say the same thing about Roma, but Roma’s director, Alfonso Cuarón, directed a little movie called Gravity a few years ago, so his movies will never be obscure again. Pawlikowski is really only known by serious cinephiles and critics. So back to Cold War. Yes, the film is absolutely stunning to look at. Every shot is a masterpiece of light and composition. And yes, it’s extremely evocative of its time and place. But the story it’s telling? A star-crossed romance? I can tell you one thing, I couldn’t have cared less about these people and whatever they were going through. Why? Because, sometimes, there is such a thing as being TOO artistic. Terrence Malick has been accused of the same thing. You can tell they love each other passionately because they stare at each other across a room? Call me crazy, but I’d like to actually see interaction and hear some dialogue before I consider myself invested with characters. And because everything in this movie is so internalized, things happen that aren’t explained and we’re asked to feel things that make no sense. Now I’m certainly not going to say that there’s not a place in the world for movies that abandon a traditional narrative structure for a more artistic approach. Terrence Malick’s Tree of Life is one of my favorite movies of this century and Alfonso Cuarón’s Roma is one of my favorite movies of this year. Both of these eschew traditional storytelling, character building and structure. But, in the end, both Malick and Cuarón found ways to make me feel something in their films. Pawlikowski’s Cold War only left me wondering what the point was and why such a beautiful film could leave me so, well, cold. So, in the end, if you are interested in a film that would be the answer to anyone questioning whether film can be art, Cold War would be the one to see. But if you are interested in a compelling story and characters to go along with it, it should not be high on your list.